It is a rare occasion that I get to bring someone along to one of my Foodepedia events, but last Sunday proved to be an almighty exception. Harrods had a VIP launch party for their new candy store and not only did I get to go, but I got to bring the family with me! So, at 8.30 in the AM, we bundled the boys into the car and took our chances driving into London. Lucky for us the Olympic lanes were not in effect and there was ample parking in the salubrious suburb of Knightsbridge. We were greeted by a Ringmaster as we came to the top of the escalators and the kids were slightly nervous as they were handed balloons and ushered into Toy Kingdom on the third floor. As soon as we got in the penny dropped and I realised this was no food event, it was a marketing exercise to target the rich and ‘VIP’ of London. Picture it, hundreds of very wealthy parents and their children trapped inside the grandest toy shop in the world. 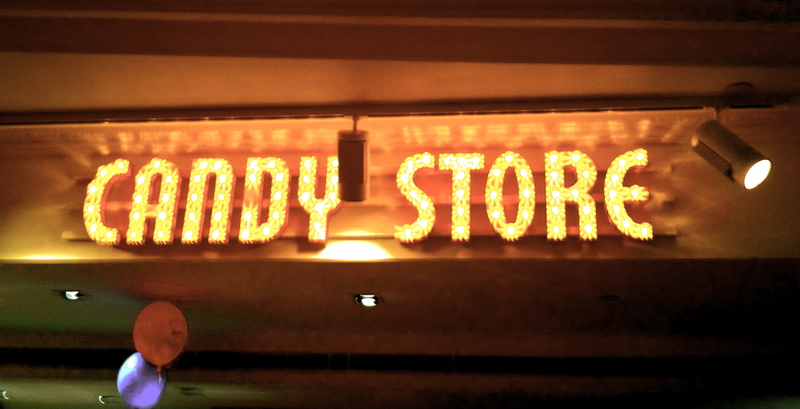 I spotted the candy store over in the corner of the newly refurbished toy department. It is pretty nice, not as big as the one in Selfridges but nice and colourful with wall to wall jelly bellies, Papabubble and vintage sweeties. I like the Harrod’s brand sweets the most, they are a circus themed and brightly packaged range with lots of nice chocolates and candies. We spent the morning wandering from room to room, fighting for space amongst other families and looking for the food that was being carried around on silver trays. There were mini-muffins, tiny shots of smoothie, miniature ice creams and these weeny little pancakes topped with a slice of caramelised banana. It was all very ‘Harrods’ and very much lived up to the circus environment they were trying to create.